Photo courtesy of Jonathan Brubacher. Toggle switch to choose between rats or locusts. Is there a stink bug in here? Pest in Reace if you want to go. That’s fine, I only need to P.
The switch on the right will rower the lamps so you can get in. So where can I turn on the ladies? I need to go into the pest room and spray. Good thing. I have to go pupa. Don’t put kids in the pest room. They should be in the plague round. I need to sleep…this is a tough choice. 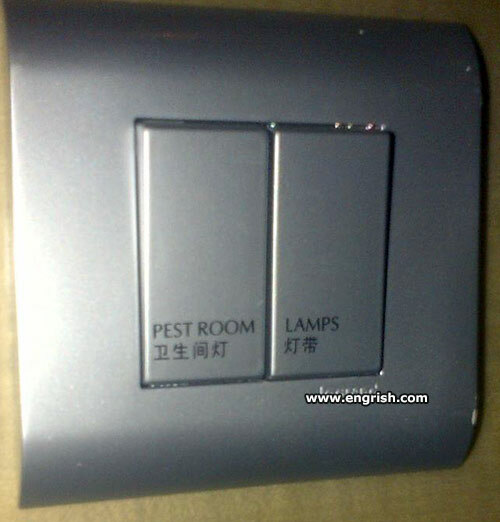 I can’t decide: Pest In Rice or Lamp Steak? @Seventy2rd o clock | 4:59 am: You mean Pest in Lice? First time I’ve seen a hotel room made especially for the kids, heh heh heh. Is it east of the Buda room? @ Droll not Troll | 5:08 am: I upgrade it to Pizza in Slice Yourself edition! Where your crabs can holiday. But I commented before reading other comments that time.